This recipe for thai food balances the sweetness of coconut milk and fragrance of galangal, kaffir lime leaves and lemongrass, with the salty fish sauce and the sour taste of lime juice. The fried chillies add a smoky flavor as well as texture, colour and heat, but not so much that it overwhelms the soup. Heat the chicken stock in large, deep pan then add the lime leaves, emongrass and galangal. Simmer for 10 minutes then add the chicken and coconut milk and bring to the boil. 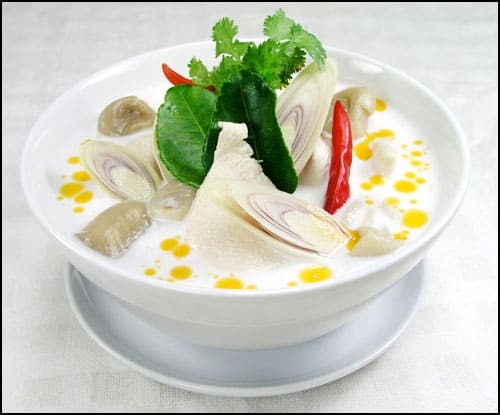 And the mushrooms, lime juice and fish sauce to the pan and bubble, uncoverd, until the chicken is cooked, about 20 minutes, Add the fried hillies to the soup and serve immediately, garnished with coriander leaves.